Incredible, rare find, roughly one minute walk to Shawnee Twin lakes or within seconds by car. Boat ramp and dock access approx one mile away. All of the pleasures of lake life living without having the lake lot lease! Own your land minutes to I-40. 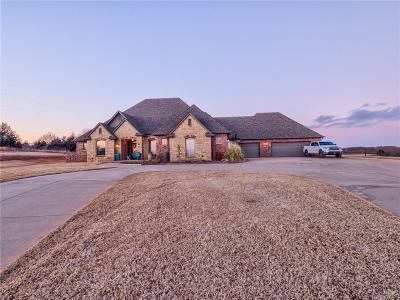 Custom built, 3 or 4 bed option with 2 full baths and 2 1/2 baths, pond view, outdoor fireplace, pergola, garage storm cellar, beautiful pond view, extra parking pad in front, circle drive and 5 car attached garage! Interior features include many extras such as soaring ceilings throughout, upgraded Bosch 5 burner stove and Bosch dishwasher, granite counter tops throughout, stamped and stained concrete floors, wood tile, upstairs theater room with projector, formal dining area and kitchen dining room combo. Over-sized master bedroom with large on-suite, high ceilings, separate claw foot soaker tub and tiled shower. Take a look before it's gone.